Maxell developed 0.1æm new Ceramic Armor Metal Particles to achieve even higher magnetic energy, and employed a new calendering technology to optimize tape surface smoothness. The result: improved short wavelength output, decreased noise, and minimized spacing loss with the head. High output is also achieved together with a superior binder that ensures long-term reliability and excellent lubrication performance which even after repeated use maintains a low error rate. Uniformly dispersed fillers within the tape formulation clean debris from the heads and minimize the head abrasion by reducing friction between the head and tape during the high speed rotating head scanner. 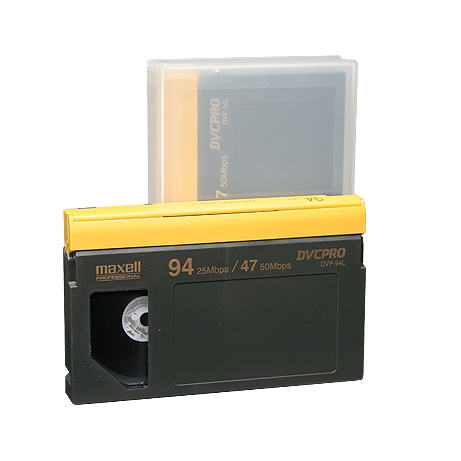 Maxell s special binder system ensures long-term durability when the tape is used in extreme ENG/EFP environments and demanding editing and playback modes such as still and shuttle. Long-term storage and high-temperature conditions can result in tape shrinkage affecting track shift. DVCPRO has an extremely narrow 18æm track width. Slight tape deformation can cause a track shift affecting subsequent playback and editing conditions. Maxell has established a production process technology minimizing the tape shrinkage factor, producing a tape with superior heat-shrinkage resistance qualities. Even after long-term storage, head tracing of the track is accurately maintained.